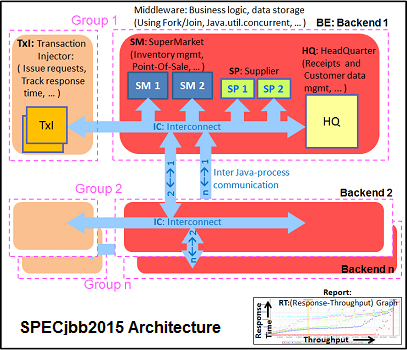 The SPECjbb®2015 benchmark has been developed from the ground up to measure performance based on the latest Java application features. It is relevant to all audiences who are interested in Java server performance, including JVM vendors, hardware developers, Java application developers, researchers and members of the academic community. While Java SE 10 (and earlier) results using V1.02 remain comparable to V1.01 results, V1.01 will not work with Java SE 11 or later. This makes it important to move ahead to V1.02. After April 25, 2019 all result submissions must be made using V1.02 and V1.01 will be retired. Licensees of version 1.0 and 1.01 are entitled to a complimentary V1.02 upgrade. For a list of changes in the SPECjbb®2015 benchmark relative to the retired SPECjbb®2013 benchmark, please see the release notes. Both a pure throughput metric and a metric that measures critical throughput under service level agreements (SLAs) specifying response times ranging from 10ms to 100ms. Includes all of the results submitted to SPEC from licensees of the benchmark.